I really like how the Growl application for the Mac works. It provides a notification framework that all applications can use. I often find my self needing to display notifications to the user in my web applications. 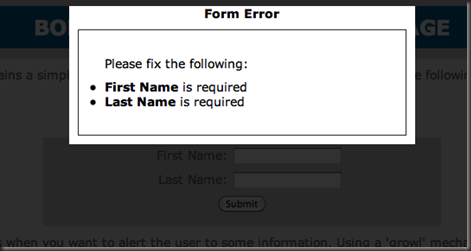 For instance, when the user incorrectly fills out a form. Here is a screen shot of a simple ‘growl notification’. 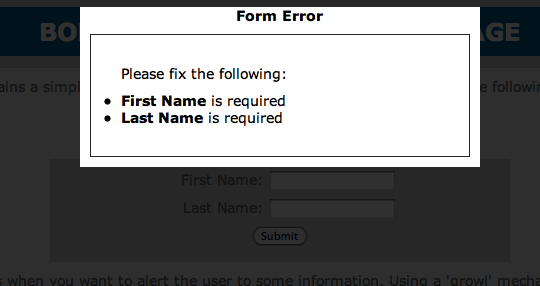 This is not complicated to add to an application. In the vein of “Don’t Repeat Yourself” I have put created a ‘growl package’ that can be downloaded below. For a live example check out the demo. //  are hooked up. This code executes once. // Size the mask and growl window. // Calculate the notification position. The CSS above adds a bit of style. This will certainly need a touch up to blend into the application. msg += "<li><strong>First Name</strong> is required</li>"
msg += "<li><strong>Last Name</strong> is required</li>"
Adding growl notifications to an ASP.NET MVC application involves a couple of steps. First add growl support to your controller base class (create one if you don’t have one). Notice that ‘TempData’ is used instead of ‘ViewData’. This allows growl notifications to live through redirects. Any controller that needs growl support should inherit from this base class. This is a pretty simple library. There are more features that can be added. If you give it a test drive, let me know how you like it. The problem with this is the person has to click to get out of the window which i don’t like. Its like an extra tax on them for not filling in the fields properly.